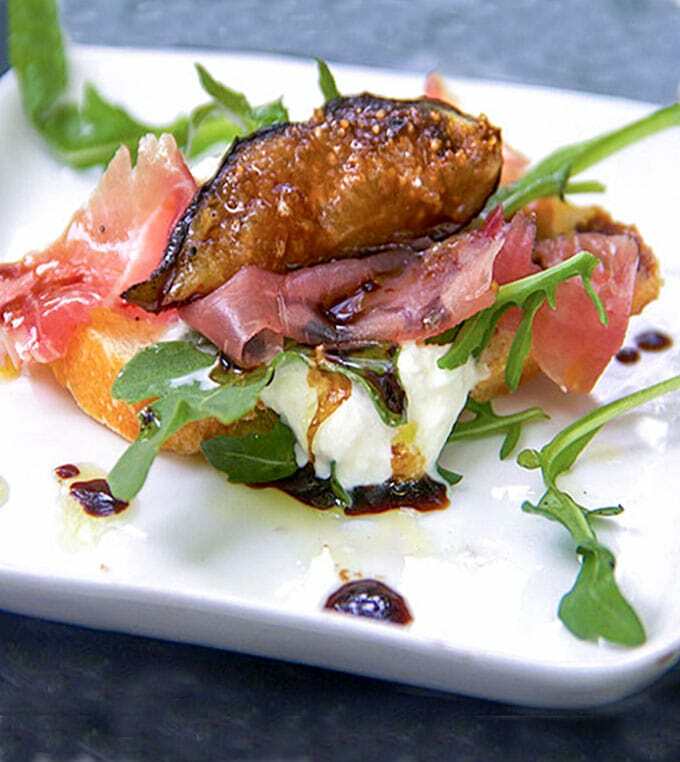 Here’s an easy appetizer that’s elegant and delicious: Grilled Figs, Prosciutto, and Burrata. Arrange it on individual toasts or set it out on a platter and let everyone make their own. If you’re not familiar with burrata, it’s a type of mozzarella cheese that’s incredibly buttery and creamy. It’s an Italian creation, made from a mix of mozzarella curds and cream that are stuffed into a sturdier shell of mozzarella. As exotic as it is, burrata is becoming more mainstream these days – you can actually find it at Whole Foods, Trader Joe’s and many major supermarkets! This is an easy dish to pull together. 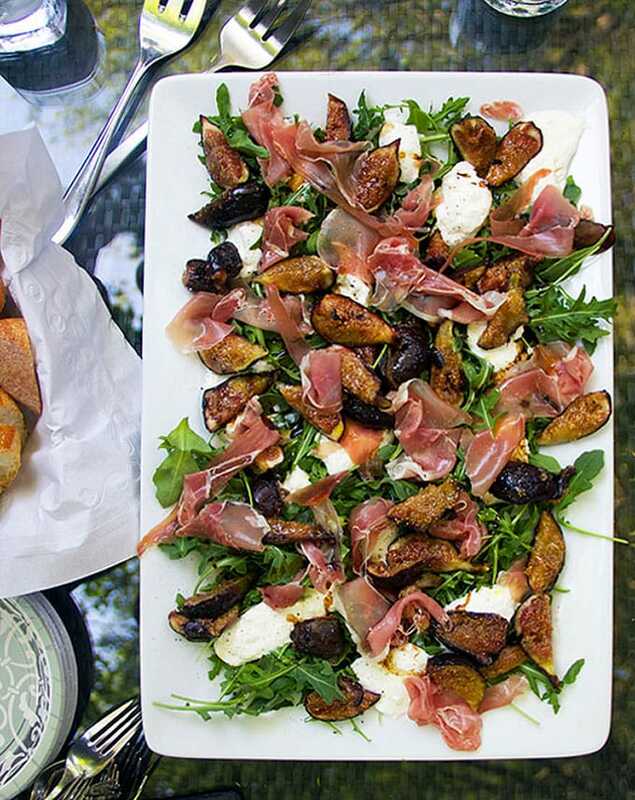 It takes just a few minutes to grill the figs. If you’ve never tried fresh grilled figs, they are pretty great! I decided to make a platter, with small plates and sliced baguette on the side – so everyone, including my gluten-free friends – would be happy. If you prefer, you can arrange everything on sliced baguette and serve this bruschetta-style. If you get hooked on burrata and want more recipes, here’s a good one to start with – from Cooking Light – Fettuccine with Seared Tomatoes, Spinach, and Burrata. I hope you have a happy 4th of July and a great weekend! 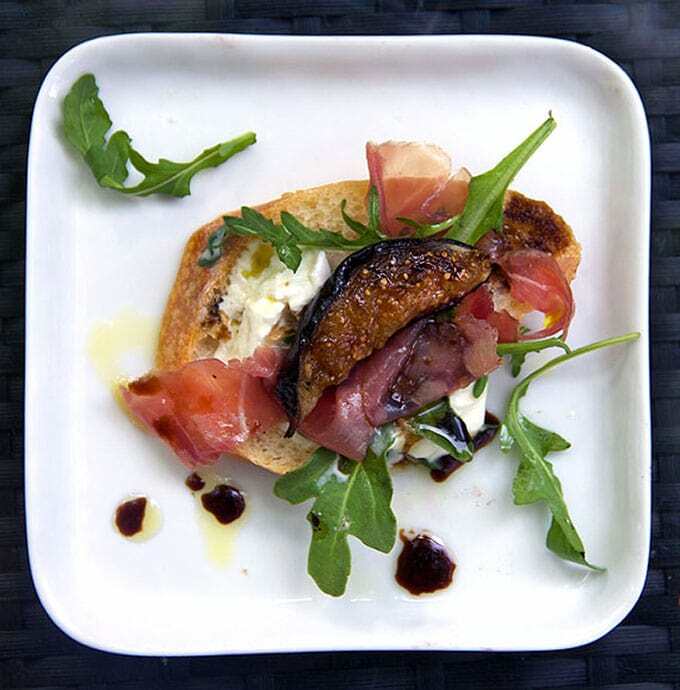 Here’s the recipe for Grilled Figs, Prosciutto and Burrata.If you try this recipe I hope you’ll come back to leave a rating and a comment. I’d love to know what you think! 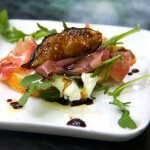 An elegant appetizer of fresh grilled figs, prosciutto and burrata. Serve on a platter with bread on the side or atop crostini, as an hors d’oeuvre. Preheat the grill to medium-high. Brush the sliced figs with olive oil on both sides. Set the figs on the grill cut side up for 2 minutes. Flip them over and cook them for 2-3 minutes more, just until they get a little brown but be careful to remove them before they get too mushy. Slice each fig again so you have quarters. Spread the arugula leave out evenly on a large platter. Scatter the fig quarters evenly around the platter. Use a teaspoon to scoop out the burrata and place blobs of it evenly around the platter. Pull prosciutto apart into bite sized strips and place it evenly around. Drizzle 2-3 tablespoons olive oil and 2-3 tablespoons balsamic vinegar over everything. Sprinkle with a pinch or two of salt and a few grinds of black pepper. Serve with sliced baguette, if you like. Another wonderful appetizer. Made it last weekend and it went down a treat. Looks great and tastes delicious. I was asked did I cook a lot as it was so good, but I had to fess up and say I got this from panning the globe. I am not the best cook but your recipies are so reliable I can depend on them to be a hit whenever I bring them to gathreings. Everything about this I love. I could eat this flavor combination all day long! I made this this weekend for a family gathering and it was awesome. It was easy and quick to assemble and it looked like I spent the whole day working on it. Everyone loved it. I will be making this again and again. You are right—how this not be amazing with the ingredients that are involved. I had to pin it of course. Normally I do the food itself. But I was really taken with it platter style and to truly get the feel you had to have the pic with your guests too. That photo totally gave me a sense of place. Good job. What a delicious treat! And how fun to see a casual shot of it being enjoyed by the gourmand Dr. Michael G.
Oh drat – our fig season finished about a month ago – will have to wait until next season to try fabulous sounding recipe. so sorry about that – I wasn’t thinking about fig season in NZ. Maybe you can substitute grilled peaches! I lived it! It was so delicious and the perfect thing to serve outdoors on a summer night.